- and a lot more! A huge thank you for the great support and suggestions. The brushes toolbar is a much needed addition. Thanks! The community portal sounds awesome! Can't wait. And the "a lot more", well, I'm sure it will be awesome too. Thanks! Sounds good. Keep up the good work. Everyone I show this game to is very intrigued by it and wants to try it. It's super unique - most people I show it to say it's the coolest thing they've seen on the iPad. Well done and keep those terrific updates coming! Having our works on display within the app and to other users would be great. Loving the app. Had to uninstall then reinstall again just so I could start from the beginning again, so I would like to see more assignments to create. community portal is almost done. Stay tuned! All the updates sound great, and incredibly daunting! I wish you the best of luck in all that mess of work you have cut out for you and I will be as patient as possible for the next update. Thanks for your hard work! Excellent stuff, what about the issue of the snapshots getting cut off the top when working with a tall pot? Also, the image quality is jagged on the website, it's hard to see the details of some peoples work..
We are aware of that however it is a technical issue and there is no easy walkaround. The 3D engine we are using will provide better options for grabbing images in the future so we will address this issue. As for the save files we are trying to locate the problem. Wonderful product! Unfortunate that you lose the ability to see in full view any pot sold. And since a collection has a finite limit, it would be nice if any pot uploaded to the web site could be viewed in full view as when originally created. That is, not just a tiny snapshot, but rather a full resolution image that you see when it is on the auction block. Just a wish. about how long till next update? cant wait for new brushes! Robert, we are working on it. Thank you for your comment. Some wishes from someone who is enjoying this game. 1). A way to position the pottery when it goes into the collection so that it show exactly the view you want. 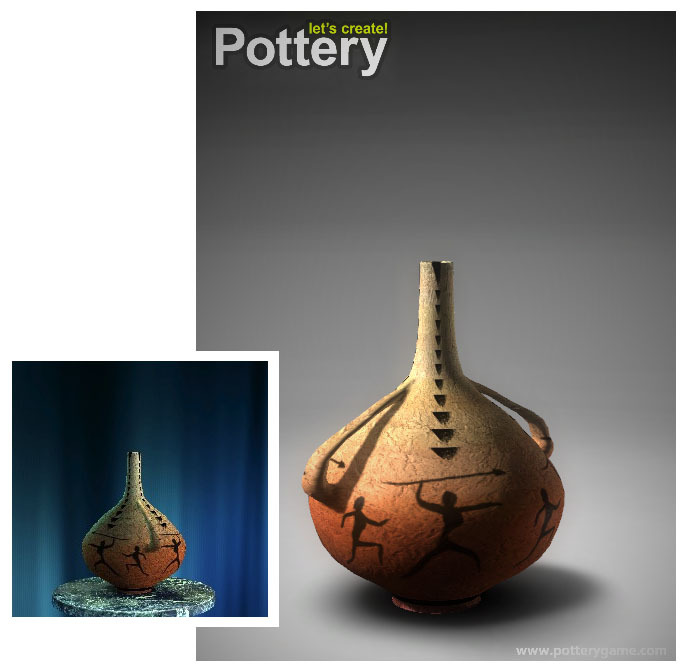 It is annoying to work on a pot, get it exactly how you want and then when it takes the picture to send off to the community for others to look at, the best view is not captured. 2). An ability to send the pottery back from collection to making the pot, at least one time. Sometimes you see an error in collection that doesn't really show up beforehand. 3). An erasure option that is more flexible than the straight line only across the pot, vertical as well as horizontal. Also a way to limit the length across. Maybe the pots can have an understructure of squares and individual squares can be erased. If the squares are small enough, quite elaborate designs can be cut out of solid colors or of existing blocks. A separate ability to color in these squares. 4). An ability to rotate the brushes. 5). An ability to put the brushes in as blocks, rather than straight across only. 6). A way to take only a section of a brush, to mix and match with other brush sections (for example, in the Neanderthal brushes, just one of the hunters running after one of the horses). Thanks for reading my wishes. Just happy to be here. Please check out our new feature on the Community Portal. The 3D viewer is a huge boon when voting on pots! It can greatly enhance the look of a pot or, equally, show off the flaws in detail. So happy you have brought this online. From now on I will use this app before voting. Thanks. It looks so great. I wish me such a feature for my ipad version and not only fo pc or mac! Will you be adding game Center achievements ? We are indeed working on new features and content for the game so stay tuned as more is coming . We are waiting for new features and an improved voting system. Please tell us: when is the next update? My personal gripe with the app is the handles always look wonky. I want to make a vase with an interesting shape, but I want the handles to be handles, not go in and out following the contours of the vase. also, they will chop inches off of them, etc... I would like it to just add them, as they look. maybe include the option to have them follow the contours, but if not, just attach the top and bottom, and leave the rest alone. who's with me on this? Other than that, i love the app. Today we have short info about upcoming update for Let’s Create! Pottery. You can expect more brushes, support for Game Center and bunch of new quest very shortly. Stay tuned for more info soon and feel free to discuss and make your wishes in this thread. Thank you! I'm new to the forums, but not the game. The update is much appreciated. I've noticed feature requests in just about every post on here. I was wondering if there is a centralized place to put our requests? Is this it? I'd love to see bigger photos for the quests. Even on my iPad, it's difficult to see at times. If it can't make it into the game maybe a (closed) thread on here? A lot of my thoughts have already been suggested, so I'll leave at that, which is the most important to me. Other than new quests and new brushes- can't wait for the update! Do you think it be possible to create a vertical "wipe-out" brush?? ?That would be such fun!!!!! Thanks for this suggestion. Very good idea to consider in the next update. My girlfriend and i both have this game and we have just spent hours trying to find where the photos have gone from all the pots we have created and photographed, only to read here on the forums that once a pot is sold, you can no longer view the photograph. If i were into real world pottery, i would definately take a photo of every creation i made... And i certainly would not delete/destroy my photos once my pots sold. I know it is possible... And simple to take a screen shot using my ipad, but it is an obviously "missing" feature if i have to use an "out of game" mechanic to be able to view photos that i have already taken within the app itself. The changes and additions you're working on sound terrific! Is there any way you can adjust it so that brushes can be placed more accurately? You know - instead of the "jumps" like we have now? Keep up the good work! I sincerely hope our feedback and suggestions will help you make a great app even better. Great job! Thoroughly enjoying this app. With all the new features you're working on, have you thought about a way to overlay different brushes? Or would that be impossible? First I would like to say that I absolutely LOVE this game for the iPad. I am a 17 y/o and am on home bound. I don't have much to do during the day. I came across this game and thought it was very pricey but went ahead and bought it anyway. I have only had this game for 5 days and have already completed all the emails. I was very disappointed to see that there were only 31 orders to do, especially since the game cost so much money. I was also surprised that I had to buy extra brushes to get more orders. I was very upset. I thought I would get more for my buck. PLEASE GET MORE LEVELS. I buy this game and a set of background. I need more color! !especially brown!! 1. Profile creation. I would love to see the ability to create profiles so I can play it and keep my progress and then let my son play it without him messing up my progress. 2. reset game statistics. When i was all done, i wanted to do it again and the only way i could do it was to un-install the game and re install it. Why not just have a button that says reset game? Most games have it. 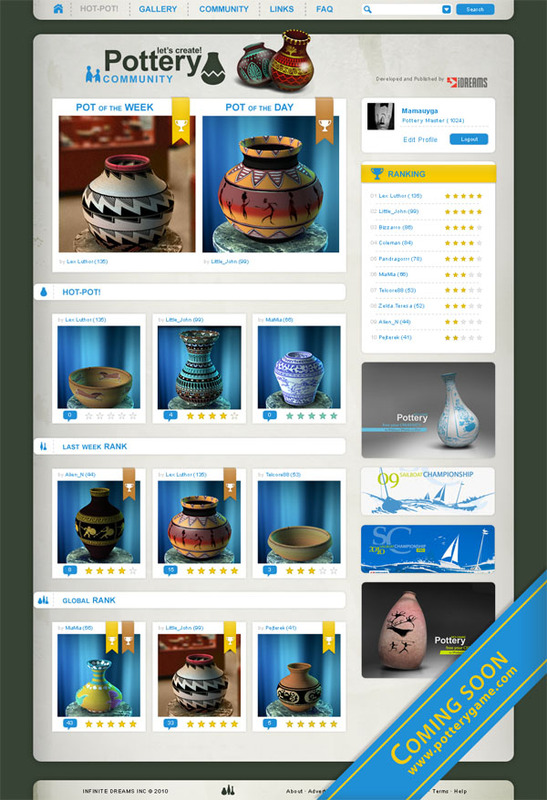 3. pottery gallery. 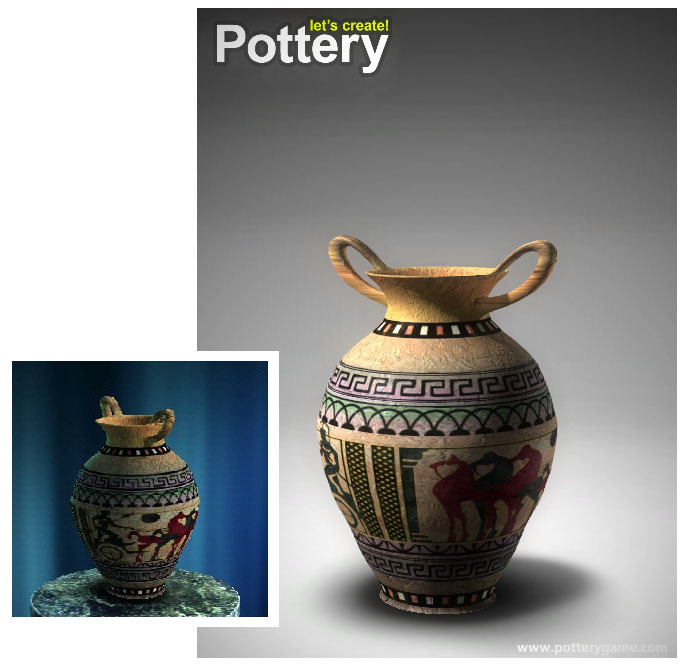 You have the ability to take a pic of the pottery, why not put it in a gallery in the app so I can go back and look at it, and have the ability to see it again to re-create it if i want, just like i can see the image when i get an email. That is all for now. Thanks for your consideration. Looks like this thread could use a wee bump! I consider myself lucky that I found this app and downloaded to my Android Tablet. I just wish I found it 2 years ago...it seems that these forums have sort of died off and I haven't seen any recent moderator activity. 1. The Unity Web Player never works for me. If it's a pain to fix it, I'd say scrap it. I don't need a fancy 3D spinning feature that doesn't work, however, the ability to zoom in on any pot on the Portal (mainly to admire someone's work) would be wonderful. 2. Lighting - it really seems that some beautiful designs seem to get lost in the shadows. It would be nice to have more lighting options before taking a photo of a pot. 3. Brushes - It would be nice if brushes that are default solid black, could be changed to other colours. This might be a huge undertaking, but could also influence creative potential exponentially. Love this app! I've made several hundred pots but, unfortunately, I don't have a "collection" feature so if I don't sell them they just go away. Also, I'd like to upload some of them but can't find a way to do it. One other question: Under achievements is shows "36 of 40" completed, but I've ceased getting email requests. Is there more I should be getting. Having complained about all that, I still can't wait each morning to start creating more! Keep the updates coming. Yes, these would be amazing. Everybody seems to ask for new emails -- how about community-generated emails? 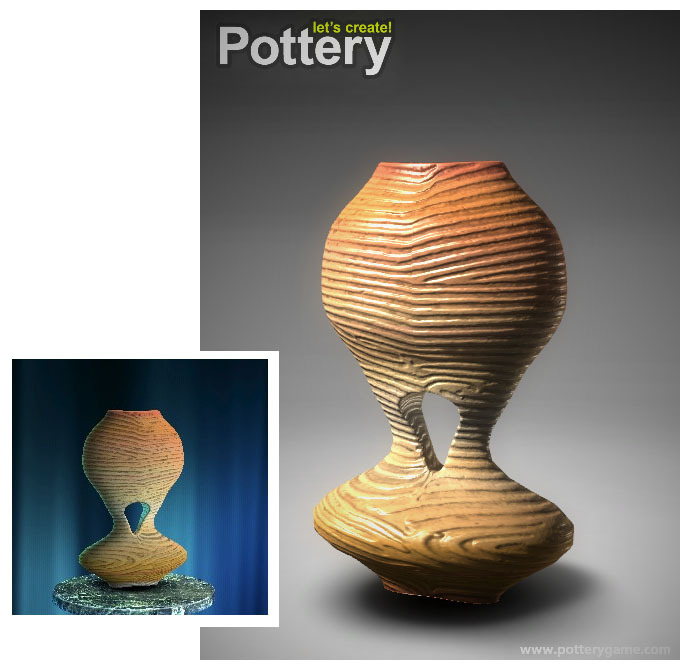 Pick a random top-rated pot from the gallery, make the email say "I love this pot design by _____ [link to gallery post if possible]. Could you try and duplicate it?" That way you don't have to go to work trying to make a new email pot. LOVE this app!!! Please make all updates available for phones HTC too!!!! I love this game it helps me distress from my day keep up the good work!!!!! I was also wondering about the daily e-mails. I've completed all the missions in the game and very much enjoyed the new daily e-mails! I only received them for 4 or 5 days and now this is the 3rd day in a row without one. Someone mentioned choosing a top rated pot each day for everyone to try and duplicate. I think that is a great idea! Perhaps the "Pot of the Day" could also be the daily e-mail? I'm sure others would love getting a new project everyday! Especially those of us who have completed all the in-game missions. Thank you for all you do! I LOVE this game! I love this game. I would like to either have more colors or brushes and free hand own design. That would be great!!! Is this game still being updated, or have the developers abandoned this game?